Notes: Griggs...revised ed cf1817;Origin "Lavoisne's Complete Genealogical, Historical, Chronological, and Geographical Atlas." 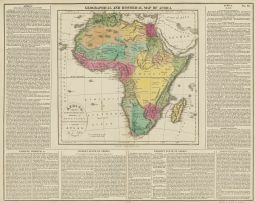 There was another edition published by John Satchell in 1829; Special to these maps is the fascinating description surrounding the map. This text discusses many of the following topics: boundaries, principal towns and populations,character, language, religion, arts, manufacturing, science, commerce, climate, soil, produce, natural history, seas, lakes, rivers, canals, mountains, government, animal populations, religion, islands, battles, colonies, sea ports, and more.